CST is pleased to introduce a new Open Frame camera solution, consisting of two cameras in one frame unit. The main advantage in this construction is when the cameras have different FOV’s in the range between 52° to 5.6°. This enables the user to ‘continue’ zooming in on an object, by switching between the two cameras while utilising a little of the digital zoom range and thereby gain a higher resolution than if using the whole digital zoom range. 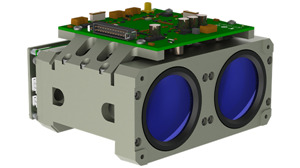 Each camera module consists of a 560 TVL 1/3" camera for day / night operation, with movable IR-cut filter. Open Frame DUAL/336 is designed to operate in very harsh environmental conditions, such as temperatures ranging from -40°C to +70°C and is therefore suitable for installation in areas with very warm climate without the expense of installing a cooling system.